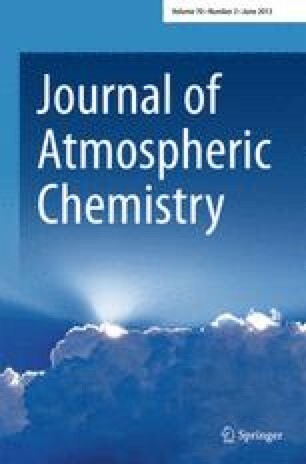 Accurate values for the rate and temperature dependence of the reaction NO + O3 → NO2 + O2 are important in the chemical modelling of photochemical processes in the atmosphere. Previous measurements have been made at low total pressures and/or with very large mixing ratios relative to those observed in the atmosphere. In this study the reaction rate has been measured using a novel approach under tropospheric conditions of temperature and pressure, and at tens of ppb (mixing ratios of 1 in 108) between 263 and 328 K. The resultant Arrhenius expression (k=Ae-Ea/RT) gives a larger activation energy (Ea/R=1670 ± 100) than the recommended literature value (Ea/R=1400 ± 200), and a larger pre-exponential factor (A=5.1 ± 1.6 × 10-12 cf. recommended A=2.0 × 10-12), but the second-order rate constant at 298 K (1.90 × 10-14 molecules cm-3 s-1 ± 10%) is similar to the recommended value. The results confirm a lack of pressure dependence of the reaction, but were made over too small a range in temperature to address the issue of curvature of the simple Arrhenius expression. 1.Institute of Terrestrial Ecology, Bush EstateMidlothianU.K. 2.Department of ChemistryUniversity of Edinburgh, The King's BuildingsEdinburghU.K.